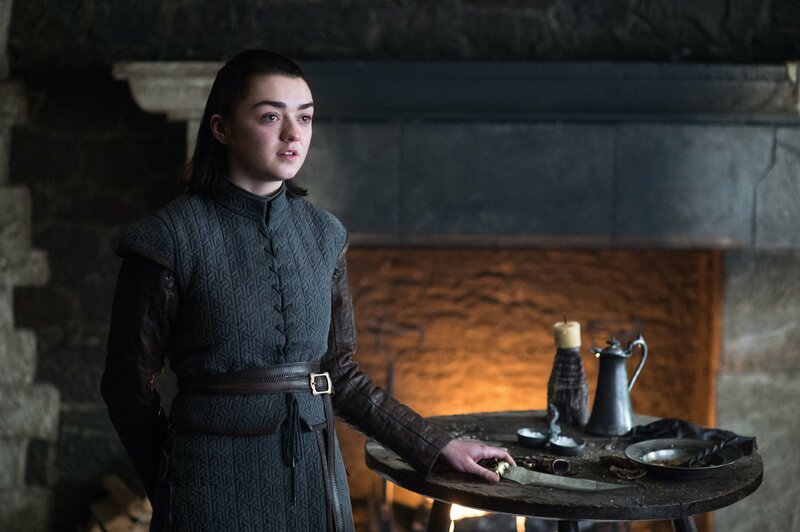 Later in the episode, Arya visits the forge at Winterfell, where she interrupts an exchange between Gendry and The Hound. Gendry awkwardly tells her she’s “gotten better” and “looks good.” She tells him he looks good too, before they move on to other, more pertinent topics. Arya wants him to tweak her Valyrian Steel dagger. The potential double meaning of that scene seems to have been an intentional choice on the part of the showrunners. In a 2013 interview with Rolling Stone, Williams revealed the episode’s director gave her some very specific cues about her parting with Gendry. “When you say that last line, ‘I can be your family,’ say it like ‘I love you.” And that’s the take that they used,” she explained. Still, not everyone’s onboard the Gendrya hype train. After Season 7 aired in 2017, Dempsie told The Hollywood Reporter the age difference between him and Maisie Williams was just too significant to ignore. “I think it’s implied in the books that there might be a romantic element to the relationship, and in the books I think the characters are significantly closer in age. I know from my personal experience, when we were filming the earlier seasons and people would ask about that and talk about that, I would feel slightly uncomfortable. I’m acting alongside a child here. I was a 25-year-old man. I sometimes found that question a little hard to address and a little tricky to answer,” he explained.